Red Flying Squid (Ommastrephes bartramii) in flight. It expands its body to make the most of the propulsion and later adjusts itself to become more aerodynamic. When you think of squid, what do you think of? You may be repulsed by their image, you might get hungry at the thought of eating them, or you may forget what squids really even look like. One thing that doesn’t cross people’s minds however is “I wonder if they can fly?” Ask almost anyone that question and they will most likely ask you to get serious. “Of course they cant fly,” they will say, ” It’s just another fish in water!” Well, besides the fact that they do indeed live in water, these people are wrong! They don’t mean to be but facts are facts! Not only are squids not fish (they are mollusks) but they CAN fly! No, they haven’t sprouted wings since the last time you checked but with the same jet propulsion they use when moving through water. 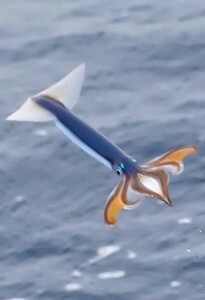 Flying squids are truly a wonderment because as retired Oceanographer Richard Young says, “It’s the first time we’ve ever had any information comparing flight in air with flight in water” and it is here that we have untapped knowledge that will one day lead to great innovation. So which squids fly? For now, scientist have full lab and field data (including pictures) of 4 species: Sthenoteuthis pteropus, Dosidicus gigas, Illex illecebrosus and Loligo opalescens. But don’t get me wrong, there still are many more squid that can fly! 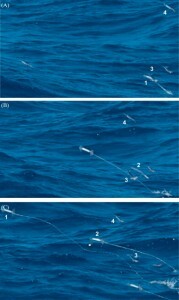 The Red Flying Squid (Ommastrephes bartammi) for example is known to fly as proven by the picture above, but merely hasn’t been thoroughly studied. In theory, most squids could fly as the jet propulsion is the main source of movement for any squid and this is why the number of squids with this ability is still not fully understood. Now you may be asking yourself, “Why would they choose to fly? Just because they can doesn’t mean they should…” Good question and it has a better answer. Using photography and calculating the distance traveled over the time in which the photos were taken, squids were recorded going over five times as fast in air than in water! This saves the approximately five times the energy they would have spent going the same distance and when an animal migrates thousands of miles a year, it is energy well saved. All in all, their are still so many questions to be answered when dealing with these squids. If they go further with less energy, why isn’t it seen more often? Is this a learned ability or a natural one? What allows for some squid to fly and others not to? As we study the habits of the flying squids and just squids in general more and more, we can always get closer to the answers. Squids are an untapped source of knowledge and I can not wait until the day were we put their methods of flight and propulsion to great use! Marshall, Jessica. “Squid Can Fly to Save Energy.” Nature.com. Nature Publishing Group, 20 Feb. 2012. Web. 26 Sept. 2012. O’Dor, R., and J. Steward. “TOS/ASLO/AGU 2012 Ocean Sciences Meeting.” Oceanography Society, 20 Feb. 2012. Web. 27 Sept. 2012. After your effusive first paragraph, I have to ask — do they really fly? or is this just a leap out of the water with a short glide back in? Because you didn’t give any number (is there any measurement of the length of a glide? ), it feels like an exaggeration.